Pink Lemonade Hand Pies. 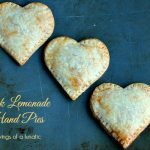 Lemon curd filled hand pies that will delight your taste buds! In a medium sized saucepan, combine the granulated sugar, flour. cornstarch, and salt. Stir in the milk, lemon juice, and lemon zest. Cook over medium-high heat, stirring frequently, until the mixture comes to a boil. Stir in the butter. Beat the egg yolks in a large bowl. Gradually whisk 1/2 cup (188 ml) of the hot lemon mixture into the beaten eggs. Whisk the egg mixture back into the sugar mixture in the saucepan and lower the heat to medium-low, for 10 to 15 minutes, until thickened. Remove from the heat and allow to cool to room temperature. Refrigerate the mixture for at least 4 hours, until firm. Grease and flour a large baking sheet, or line a large baking sheet with parchment. Flour both sides of your piecrusts, then roll flat with a rolling pin. Using a 3 to 4-inch (7.5 to 10 cm) star-shaped cookie cutter, cut twenty four stars from the dough, twelve for bottoms crust and twelve for the top crust. Lay out the twelve bottom crusts on the prepared baking sheet. Brush each bottom crust with egg white, using a silicone basting brush. Dispense a 1 1/2-inch (about 4 cm) dollop of lemon filling in the center of each bottom crust. Place a top crust over each bottom crust and press firmly around the sides only, sealing the filling inside. Seal your edges completely by pressing a fork to make indents around the edges. Bake on center rack for 15 to 18 minutes. The crust will be nice and golden. Remove from oven, and transfer to a cooling rack. Sift the confectioners' sugar over top. Allow to cool for 15 minutes before serving. Serve with a big old pink lemonade smile! Recipe is used with permission from Page Street Publishing. I could not find pink lemons so I used regular lemons and some food colouring. I would seriously mix a slurry for adding the cornstarch and flour. Otherwise you will likely need to sieve, or strain, your curd. I made these into hand pies without the sticks. It's just easier for lunches and eating on the go for us.